Joshua, 24 from San Juan, Texas, graduated from the Professional Welder program at Tulsa Welding School back in January 2013. Thanks for your time, Joshua. What made you choose a career in welding? To be honest, I was lost my last three years of high school because I didn’t know what I wanted to do next. One summer, when I was a sophomore going into my junior year, my mother got a letter from a community college saying I could attend a free welding course for a year. It was the summer, I had two jobs and didn’t know anything about welding, but I was curious, so I thought I’d give it a try. You made it your career, so I guess you enjoyed it? It was really interesting. It was something I’d never seen before, and it seemed pretty cool with all the sparks and melting metal! At first, just like every welder, I completely sucked. I didn’t know what I was doing, but it was fun. After that summer I took a welding class in high school. So in my junior and senior years of high school, I pounded pretty hard on welding stuff. 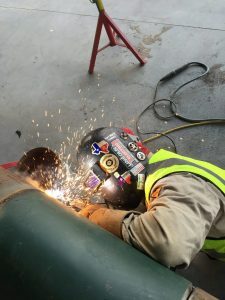 Why did you choose welding school? I enjoyed welding more when I started getting better. It was fun to start, but when I saw my welds coming out better, that’s when I realized it was a cool thing to do. When a recruiter came to my school to talk about Tulsa Welding School, I made my decision to go to welding school and pursue it as a career. How was moving away from home? Honestly, it was kind of scary, I’m not going to lie. I was 19 when I graduated high school. I graduated May 31, then everything happened so quickly. I started the Tulsa program in June, or maybe early July, but those first few weeks after graduation went by in the blink of an eye. The whole thing was a very good experience. The instructors were great, very helpful. If you have questions, they’ll come in the booth, watch you weld and correct you. Just like every student, I had trouble in some phases, but the instructor would put on his hood and have me show him what I was doing. He’d tell me what I was doing wrong, running too hot or going too slow. That’s what I enjoyed. Did you use Career Services to get your first job? I did utilize them. They gave us leads, but I had friends out in the field working already, so I used them to help me out. They directed me to my first job. 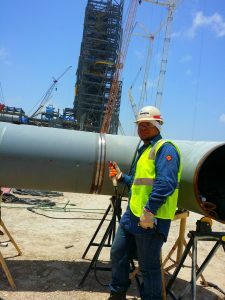 Two weeks after graduation, I was working for an offshore company out of Corpus Christi, TX, welding pipe. I’m heading to Alpine, Alaska, with Repcon. I’m going to be doing maintenance on a ConocoPhillips plant. I have to take a lot of animal safety classes. It’s going to be an experience! I’ve worked for 17 companies all over the country—California, New Mexico, Arkansas, Florida, Texas—in the last five years. 17 companies in five years? Yes, I’m self-employed and have my own rig. I go out on different projects—mostly maintenance, shut downs, new construction. It’s a few weeks here, a few months there, for different companies. How long will you be in Alaska? Anywhere from four to six weeks. My buddy, who has been before, told me the last time they sent him for six weeks, then sent him home for two weeks, then sent him back for another six weeks. When you’re done, how do you find the next job? It’s my contacts, my reputation. It’s true what they say: “It’s not what you know, it’s who you know.” A lot of these jobs depend on connections. You’ve got to keep your connections. Also, let your work speak for itself out there. That’s your reputation. I’ve met a ton of welders who like to say this and that, but when it comes to their work, they’re not all that. I’m a firm believer in letting my work speak for itself. I don’t go into a job acting like this or that because, let’s be real, there is always someone out there better than you. I just keep it chill and do what I was hired to do. How did you start finding work before you made all your connections? You’ve got to be hungry. Sometimes you might not have a connection, but where there’s a will, there’s a way. Don’t get me wrong, there have been times where it has been tough for me to find work, but I’m constantly searching for the next opportunity. Even when I’m on a job, I’m looking for what’s out there. Do you still have connections from your time at Tulsa? Yes, I do. I’ve stayed close to a few. We’ve passed opportunities between us. You’ve got to keep your connections. My phone is very important to me. My contacts are worth money. Did you do anything exciting with your first welding pay check five years ago? That first check wasn’t as big as the checks I make now, but being 19 and seeing that kind of money was exciting. I treated myself with the whole check/ I don’t remember what I spent it on, but I went crazy with it! I’ve been averaging $100k-150k a year the last few years. There are companies out there known as double-time companies. After 40 hours, you make double time, not time and a half. I worked for a company making $45 an hour for eight hours. Then the last two hours of my shift every day I made $90/hour. The per diem was $170. That was a two-week turnaround, and I pulled in $10,000. I didn’t realize how much welders can make until I got into the field. I was amazed. In the next 10 to 15 years, I’m hoping to have my business up and running. I want to invest the money I’m making now. What business? I’m not sure yet. I’m looking into it. Maybe I’ll open a franchise. It’s a work in progress right now. I love welding, but I don’t see myself welding at 60 years old. Being part of big projects. When I go from project to project, working at these massive plants, you realize that your work is going to make a difference for years to come. I know I’ve got welds down in California, Florida, all over the country, and that means something. You’ve got to like welding. Don’t go to welding school for the wrong reasons. Don’t go into this for the money. I didn’t see the $$$ at first. At first it was curiosity, then I liked it. The next thing I knew, I was in love with it. You’ve got to love welding to be successful. You’ve got to have a passion for it. If you are going into the Tulsa program because you have that passion, I’d say, ask questions. If you’re having trouble, don’t be afraid to go to an instructor and ask for help. These guys are great, great, instructors. I won’t forget them. They helped me get to where I wanted to be.